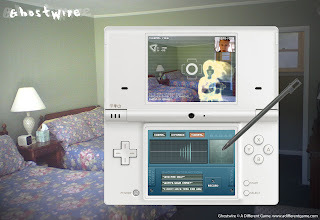 Ghostwire on the Nintendo DSi lets you hunt ghosts using the DSi's built-in cameras. Stockholm - May 25, 2009. The Swedish games studio A Different Game today announced that they have begun development of the augmented reality game "Ghostwire" for the new Nintendo DSi platform. Using the DSi's built-in cameras, the game allows you to find and hunt ghosts seen through the camera lens and projected onto the real world. Ghostwire is a collection- and adventure game, where you use your handheld device to communicate with ghosts. Your portable device is used as a portal to the astral plane, and helps you find and collect ghosts that exist all around you. In your quest you use real tools, such as the built-in camera and microphone, as well as abstract ones like a "frequency modulator" for tuning in ghosts. Once you find the spirits, you document them and find out why they haunt our world. They can also give you riddles to solve. Ultimately, you can help them to find peace. "The Nintendo DSi platform is perfect for this game" says Anders Bergman, lead game designer of Ghostwire. "This allows us to enhance the integrated real-world experience with the combination of camera, microphone and touch screen." Ghostwire received a lot of attention last year, when it won 1st prize in Nokia's N-Gage Mobile Games Innovation Challenge 2008, and was later nominated in two categories in the International Mobile Gaming Awards (IMGA) 2009. Since then, the game has been in development by A Different Game for various smartphones and handheld devices.